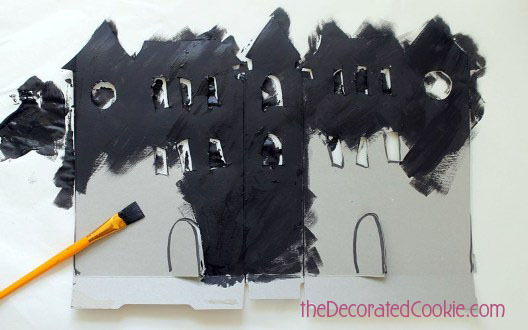 What scary fun to transform a cereal box into a dark and gloomy haunted house. 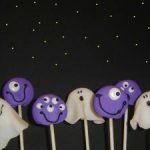 Plus, I made Kix treats-on-sticks turned ghosts complete the ominous cereal box haunted house scene. 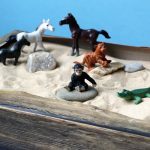 This was a trial run I did for my gig at Kix Cereal. And you get it instead. Start with an empty box of cereal. Unfold the box and carefully open at the seam. 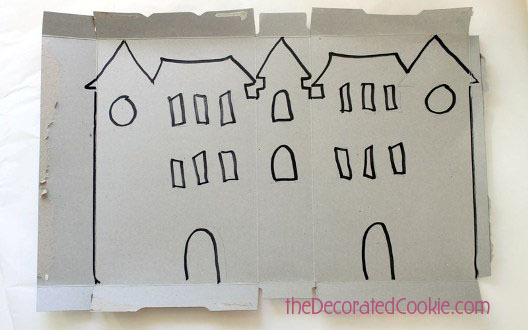 On the back of the box, use a pencil to draw your house silhouette and then trace with marker. Use the image shown or make your own. Cut out the house, being sure to keep the cereal box flaps at the bottom. Don’t worry about precision. Jagged edges just add to the ambiance. 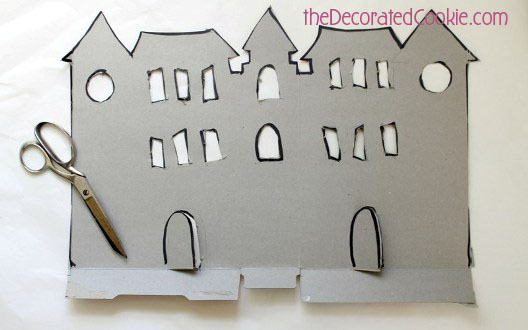 Carefully cut out the windows and the doors. Paint the house black. 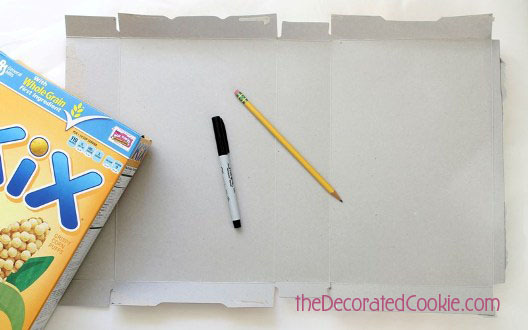 Tape or glue tissue paper or construction paper to the reverse side of the box to cover the windows. 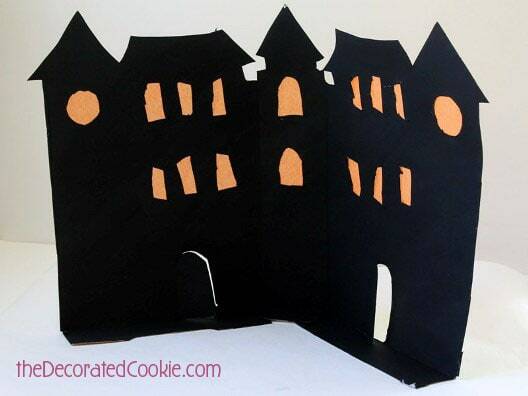 TIP: If you want the haunted house to be seen from all sides, cover the entire back of the house with orange or yellow construction paper. 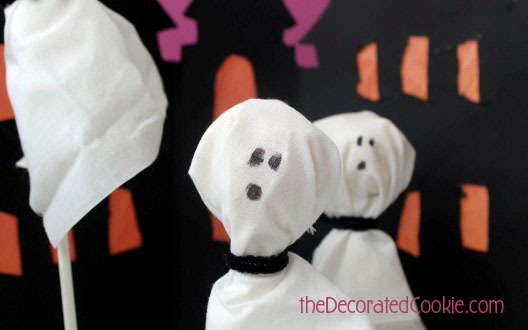 Decorate the front side with Halloween stickers, construction paper creatures, or just leave as is. *Find the fabric, pipe cleaners and lollipop sticks in the craft store. 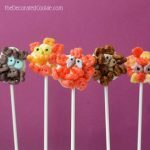 For the lollipop sticks, use any size you like, but I used a variety of heights here (6-inch, 8-inch and 12-inch). 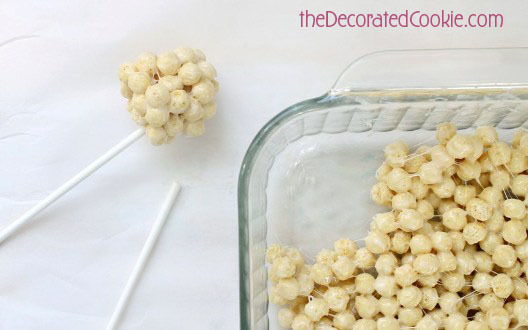 To make the Kix treats, place the butter and marshmallows in the bowl. Microwave for 90 seconds to 2 minutes, or until the marshmallows puff up and are almost melted. You may also melt in a saucepan on the stovetop, if you prefer. Stir well until smooth. Immediately stir in 2 to 3 cups of Kix cereal. Press into a greased, 9-inch by 9-inch baking dish and let cool to the touch, about 15 minutes. 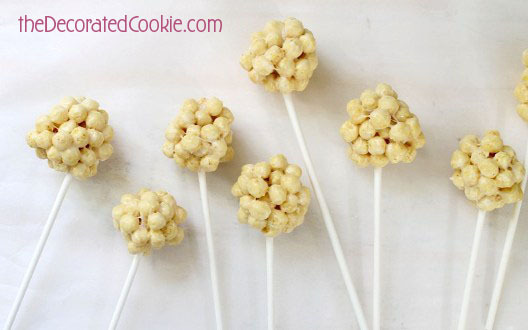 Take a 2-inch square of cereal treat in your hands and shape into a ball. Insert a lollipop stick. 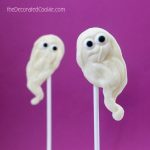 Place the pops on a baking tray lined with wax or parchment paper until fully cool before wrapping as ghosts. Makes 16 pops. 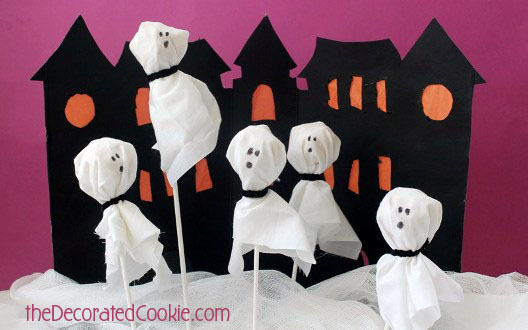 To wrap as ghosts, cut out squares of wax paper or plastic wrap about 5 inches square. Cut out white fabric about 8 inches square. Wrap the Kix pop with the wax paper or plastic wrap. Top with fabric and secure with a piece of black or white pipe cleaner. Use a black marker to draw the ghost face. 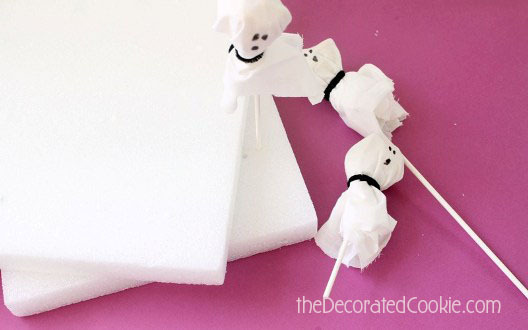 To display, prop the house on a large Styrofoam block (Tip: Secure the house to the block with pins). Find the blocks in the craft store. You’ll need a block, or combination of blocks, about 18-inches wide and as deep as you prefer. Here, two 10 x 12 x 1 inch blocks are used. 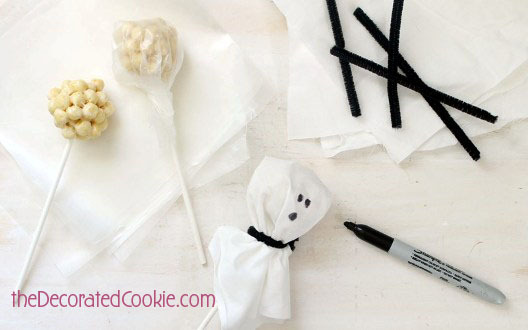 You can then cover the block with tissue paper and then add the ghost pops. 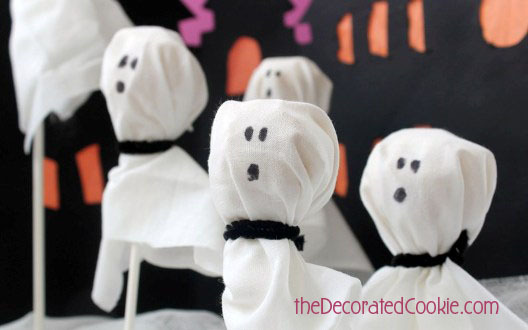 Or, use cheesecloth to look like fog, as shown here.